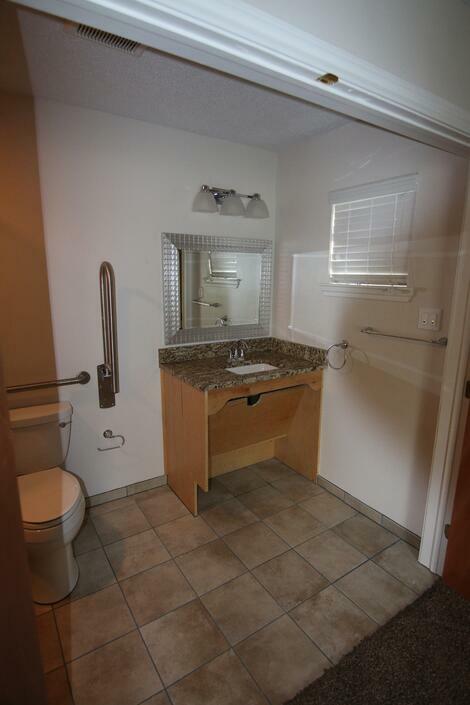 A completely serviceable special needs bathroom must contain ADA vanities and the accessible route must be defined. 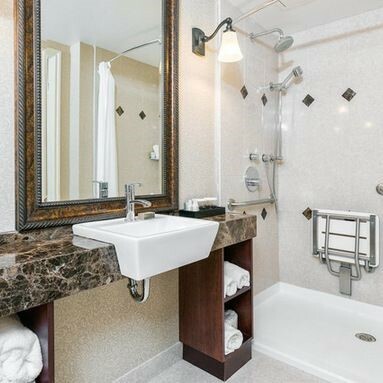 The vanity must be one with a clear underneath scald protected area having an unobstructed roll under capability for wheelchairs. 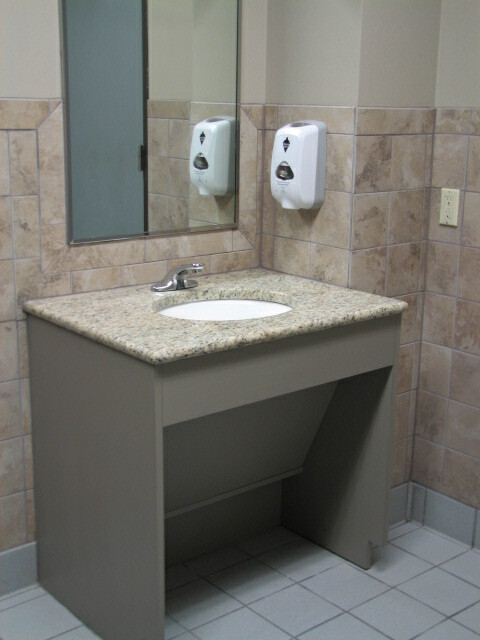 A five foot turning radius allowing the wheelchair to maneuver an approach must also be associated with the ADA vanity. The area of travel will then be enhanced by an unobstructed clear accessible barrier free route dedicated to reaching the vanity. Whether the job concerns ADA remodeling or new construction, commercial or residential, the end result will always be the same in aiding those who no longer or have never had the choice of a means of locomotion. Sometimes folks need a little help beyond the rest of us to be self sufficient and hold on to their dignity. That's when the clear accessible route comes into play. This designated route will make it possible for those with special needs to enter through the front door and travel into any room of the structure without barriers especially entering the accessible bathroom. There are basically two styles of ADA bathroom vanities that comply with an unobstructed roll under area below the sink. This capability has everything to do with both the water supply lines and the main waste line connecting the sink. There must be provisions made to protect the user from being scalded when coming into contact with any one of the plumbing pipes serving the sink. These connecting pipes may become heated merely by the water passing through them creating the problem. The open type model should always receive both waste and supply insulating jackets applied directly to the pipes providing protection for the wheelchair user. The closed model concealing the pipes will be equipped with a removable face or face board covering the pipes. This pipe concealing panel must be installed at the correct angle. This allows for the needed unobstructed legroom required for the user. 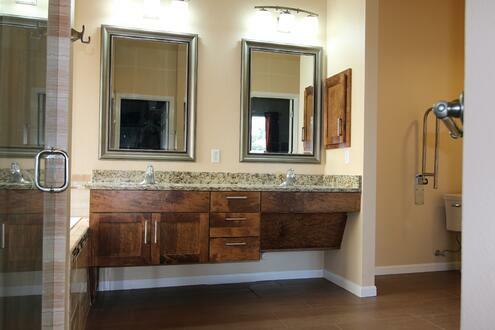 The vanity can extend beyond the sink but the area containing the sink is required to have this roll under capability. This section of the vanity must not be any taller than 34 inches above the finished floor with sufficient lower clearance. Clear unobstructed reach distances around the countertop area must be observed. 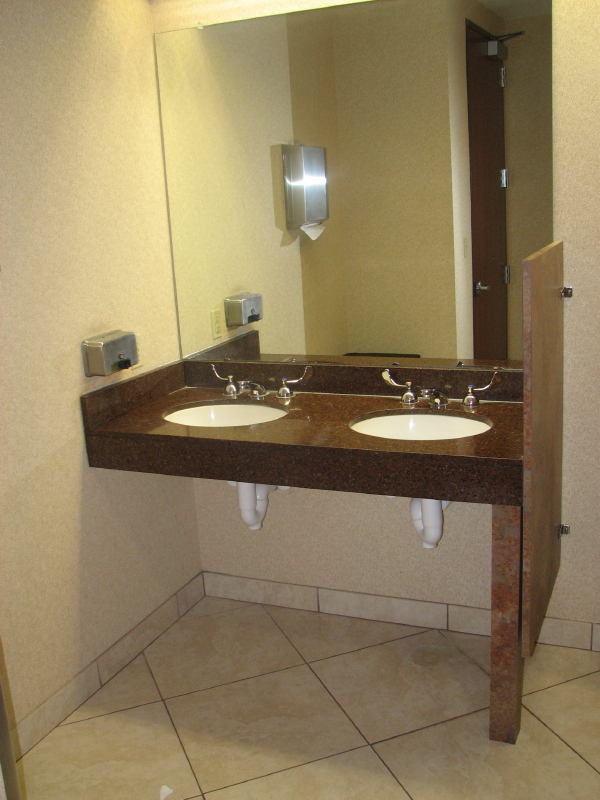 Any motion controlled sensors integrated into the various dispensing devices and/or plumbing fixtures throughout the restroom present a true hands free benefit to all the restroom users. If these aren't in the budget then at least wrist handles used for controlling the faucet can be incorporated into the design of the vanity. Furthermore, automatic flush valves should be used on all toilets and urinals that provide for hands free use. Regardless of whether there are special needs people working within a commercial building or not, we are required by law to make all the common areas ADA accessible. Homes provide a different situation when providing handicap home modifications because the alterations are put in place for specific full time occupants. The barrier free accessible route put in place must be observed as a means of life safety and function. You just never know when a personal life changing situation can appear requiring help for those with special needs. If one does occur we do have the means to offer aid and safety to those who have become afflicted in some unfortunate way and to help preserve their personal dignity and independence. When dealing with any aspect of Austin commercial construction always hire a construction professional who has the experience needed to see through the gray parts of any design ideas. A very good tenant improvement contractor like T-Square Company can help with the functionality of your new commercial cabinetry. Focusing on only one idea a paid designer furnishes won't solve the function of the commercial cabinetry project. Experience goes well beyond the primary idea presented in the line drawing. You need help in order to know what parts of the design need to be and can be tweeked so that the total function of the commercial cabinetry can be realized. Commercial cabinetry and commercial office cabinets in Austin, because of the increased use, must pass the durability test. 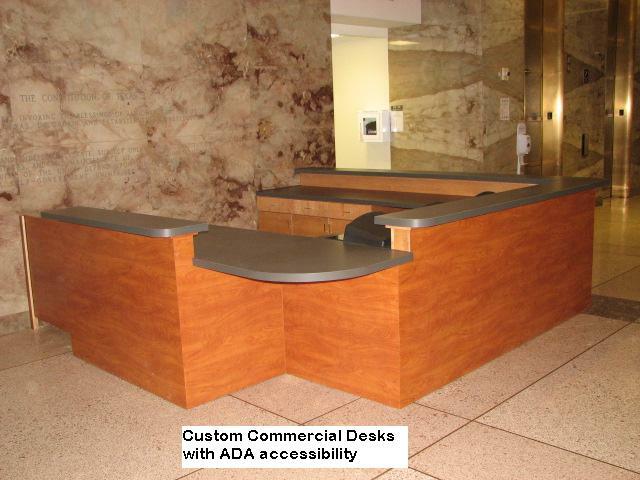 Many people use and are constantly around pieces like reception desks and the traffic must flow well. All surfaces must be durable and be able to take a pounding. Proper drawer guides must be adequately matched with drawer content weight. Shelf brackets should also fit the weight of the materials they are holding up. Counter tops must be tough but look sharp. Reach limits must be realized and comfortable so that the user never has to leave his or her chair. Before you hire a commercial construction company in Austin, Texas be sure you know their capabilities so that you can trust their judgement. Your project will go smoother when you can fully rely on your chosen qualified commercial builder. Whether you have replaced your old cabinets with a set of new fine cabinetry or just need an updated work surface atop your existing setup there are a few choices that need to be considered before choosing a new countertop for your fine cabinetry and making your final decision. Plastic laminates, solid surface material, granite, quartz, and concrete are the most popular choices today when considering new or replacement countertops for a fine kitchen upgrade. Each surface has it's own set of pros and cons to take under advisement before a conclusion is reached so that it blends with your lifestyle. Remember that any samples of materials that you see are only small representations of any larger piece when choosing products. Furthermore hotpads and cutting boards should always be used no matter which top you choose. Nonporous plastic laminates have been around for many years which is a testament to their durability. We've come a long way since the days of harvest gold and avocado green but some of this original material still exists in kitchens today. We now have different grades of laminate and the HD grade offers interesting designs and textures that help to hide scratches. Heat should never be introduced and the use of hot pads is a necessity. Seams are also a consideration when choosing laminates because they are still visible even when using today's matching seam fill products. Color caulks offered by the laminate manufactures matching their laminate colors are used where the top meets the splash for flexibility. 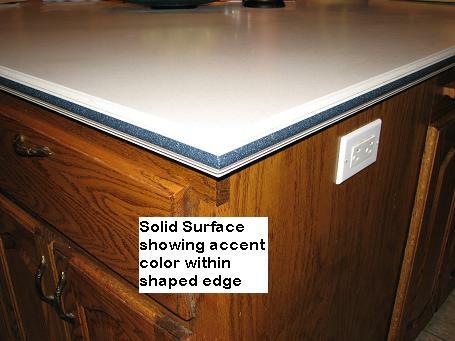 Drop in sinks are preferable when using plastic laminate but now there are some undermount units available. There are also many edge profiles produced today to enhance the look of your new laminate surface. Never use abrasive cleaners on any plastic laminate surfaces because they dull the existing finish. Granite is a natural stone coming right out of the mountain so no two slabs are exactly alike. 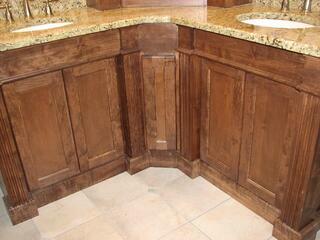 Many natural colors are available and usually lighter tops are preferred over darker stained cabinetry. The stones are cut and polished to a high gloss finish but this can be altered to produce a more dull surface by a process known as honing. There are different edge treatments available limited only by the fabricator. Seams are visible and accepted and only avoided by using larger pieces to limit the number of joints. One downfall of granite is it's porosity. 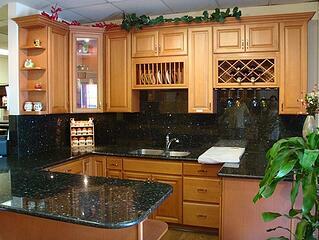 Granite tops require maintenance and must be sealed frequently. The duration between coats is directly proportional to the amount of use your top gets. A good rule of thumb is to see if water still beads up when you place on the surface. If not, reseal. Quartz is a man made product consisting of 93% stone pieces held together by resin and dyes. It is the newest material available today having bacteriostatic qualities and it is technically maintenance free due to it's nonporous surface. In its beginning this product contained small pieces of stone but now larger pieces are being used to create more interesting patterns. The overall look is a more uniform pattern than that of granite. It is the most scratch resistant choice out there but things do happen. The joints are not seen. Like granite there are no limits to the sinks that can be used. Concrete tops are poured in a mold outlining the face and edge profile. The varying colors of the substrate are accomplished by adjusting the variables within the mix like cement colors, the type of sand(s), or by the add mixes used during the mixing process. Many factors can produce shade, hue, and tone contrasts like acid etching stains used on the surface once it has been poured and set. More creative and interesting contrasts can be achieved by using additives in the mix like stainless steel filings, glow in the dark materials, or colored glass chips. Once the slab is polished it must be sealed at the rate needed per use. This process lends itself to a patina with age. Determine what is needed by first identifying your priorities. Kitchen remodeling ideas are endless. 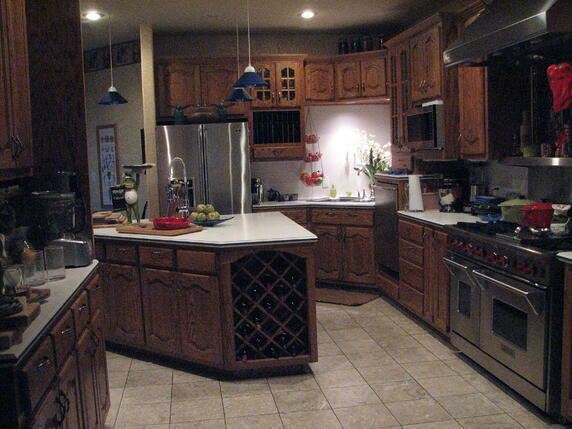 Consider how you use your kitchen as it pertains to your personal family lifestyle. Consult with everyone you know who has endured a kitchen remodel and pick up on the pointers they recognized in hind sight. Collect a series of favorite photographs and ideas from any and all media collections to construct a scrapbook of sorts. Your collection will need to be narrowed in scope to fit your situation before the final design is agreed upon when remodeling an Austin kitchen. Driving down a long straight road can be boring and not very stimulating especially if you take away the surrounding environment. This point of view is also true for a dull standard 30 or 42 inch high straight line set of wall cabinets having the same depth no matter how interesting the rest of the kitchen may be. If you line up a set of boxes it always looks like a lined up set of boxes. Why not break things up and make those fine new replacement cabinets more interesting by varying both their height and depth along the same cabinet line? Height variations can defeat the dull repetitious look and provide a place for indirect accent up lighting used in kitchen cabinets Austin, Texas. The different heights can give you more work room where needed above the cabinet top surface or create a space to display some of your most prized kitchen accents. Why not come directly above or on the cabinet top and start a special set of utensil drawers where their contents can always be seen easily? You can also mix in open shelving to display decorative articles changing the overall elevation. Inserting fancy colored or clear multitextured glass into some doors can protect the cabinet contents but produce a more open look. Wall cabinet depth variations beyond the standard twelve inches allows for special storage needs for items like 13 inch dinner plates or larger baking dishes to name a few. The standard short cabinet above the refrigerator can be expanded to an 18 inch depth making it useful for larger objects and easier to reach. Base cabinets can also vary in height to make appliances more accessible. Set your dishwasher up on a raised platform to facilitate looking into and not down onto your dishes thus saving your back. Additionally base cabinets are typically 36 inches high but some people are more comfortable with a height of 34 inches which also works well with standard height appliances. 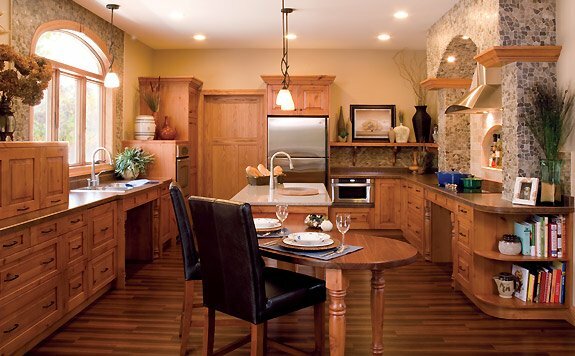 Be creative and make your new fine cabinetry custom for you the consumer. Perhaps your getting a break at the workplace and are given the chance to work remotely from home or maybe it's just something you've always wanted to create for your own privacy. For what ever reason customized home offices are becoming very popular in this day and time in our digital world. There seems to always be emails that need to be dealt with or personal research endeavors on the internet. Many homeowners are feeling the need for a defined space within their home. Well thought out home office transformations and home office designs in Austin can provide you with that secluded space to both function and concentrate away from all of life's minor distractions. 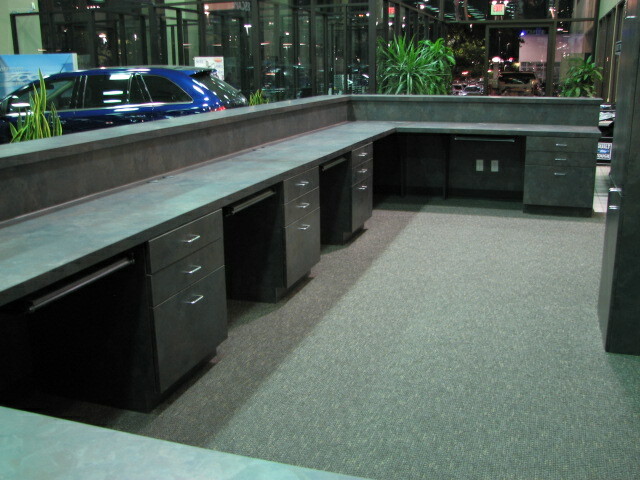 In order to make your new working area fully functional for all your specific needs you must first identify those needs. What do you want to accomplish on a daily basis within your new office? Plan out the command center, starting with your desk, and visualize your monitor's new location. Know where items like the printer, CPU, keyboard, or mouse will be located. Will they be visible or concealed? The careful design of fine cabinetry in your new office can provide for any specific needs. Good planning will solve any other problems you might face concerning storage that weren't better served by one or more of the fully shelved closets. 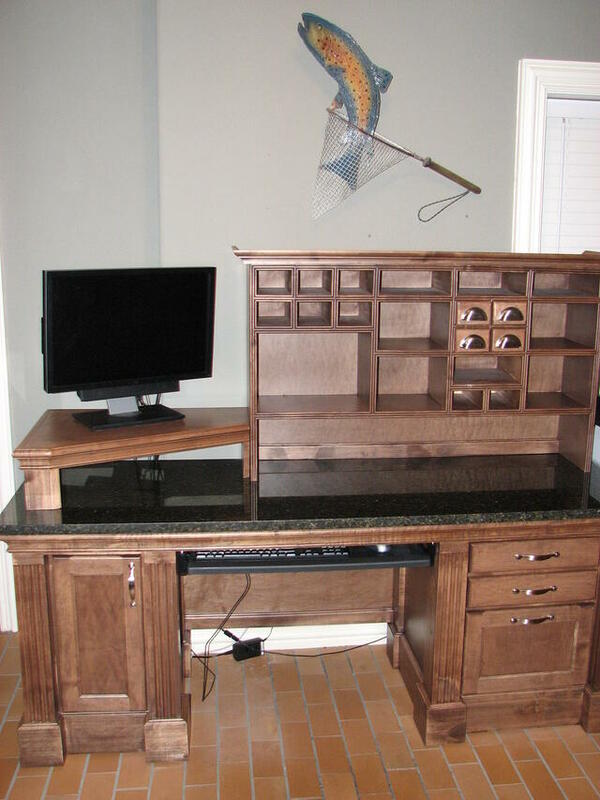 A typical custom desk can utilize a pullout keyboard unit with mouse tray, either an open CPU storage or one concealed by a beautiful hardwood door, plus the standard file and other specialty drawers. The printer can be concealed on a pullout tray behind a drawer front or simply placed on the desk top with the monitor. Storage for small office items can be accomplished using an upper unit which sits on the desk top in the old "Roll Top" fashion of design. (See Attached Photo) Your desk can sit against the wall or out in the middle of the room. Again, function! What other custom office cabinetry would help you to function properly? Do you have a lot of books and want to display them? Maybe you want to display only a select few. Should you protect the visible books with a pane of glass set into a door or leave them out on an adjustable shelf within your new bookshelves? Do you have enough books to go from floor to ceiling in one unit or can you use a credenza near the floor that is even deeper than the upper bookshelves? The credenza can contain a series of drawers over pairs of doors hiding adjustable shelves. If your design requires hardwood raised panels on the finished sides of the desk this design can spill over onto the walls creating that "courtroom" look. The wooden raised paneling can go from the base board to the ceiling's crown molding or used only as a lower wainescot with cap molding. And hey let's not forget about the ceiling to share some of the new woodwork. This repetition of style can also enhance a more sleeker European look formulated in the framess appearance of the fine cabinetry. With only imigination to slow you down remember to design for function. If you plan to remodel the ‘food production room’ in your home, then choosing your kitchen cabinets is probably going to be part of the plan. Not surprisingly, kitchen cabinetry is up for scrutiny in terms of the modernization tsunami changing home decor trends in recent times. Modern cabinets are breaking away from the ornate design found in traditional cabinet styling, rather reflecting minimal trends such as simple, clean design features. Streamlining and modernizing kitchen cabinetry or the storage cabinets used in bathroom transformations works in tandem with other kitchen or bathroom furnishings. 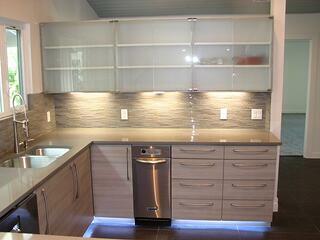 The use of new-age quartz countertops with complimentary glass tile backsplashes is becoming the norm. To the untrained eye a cabinet is just a box within a given space that fulfills a storage need. But have you ever taken the time to look closer at the cabinet's makeup beyond the cost? Before investing your hard earned money into cabinetry for a fine bathroom or kitchen upgrade take some time to get acquainted with the cabinet's parts and pieces. Cabinets are like anything else in our lives and sometimes we can be deceived by the bells and whistles the cabinet manufacturers want us all to see. They create a sense of false quality for the consumer by blinding them with noticeably concealing finishes masking the innermost important aspect of the cabinets general makeup. In the North American face frame cabinet type the use of hardwood stiles and rails covered by hardwood cabinet doors fills the bill. The most important weight bearing carcass sides, the top, and bottom or floor in a base cabinet are buried by the outer window dressing. The makeup of these aspects is not aesthetic but structural. These are the parts that sit perpendicular to the floor holding up the cabinet top and whatever is upon it. They may cut this expense by using 1/2" or 5/8" thick matrix materials like MDF or particle board and covering these with a vinyl similar to shelf paper that creates "picture wood"of any wood species. The European frameless cabinet types are generally covered entirely in a thin plastic exterior as in the case of melamine which covers up the particle board insides. Check out the picture below representing how a simple plumbing leak creating melamine failure has lead to an entire cabinet replacement. This customer had no choice! Our kitchens are no longer the "Orphan Annie’s” of our homes. This space now integrates with the rest of the home, and beautifully remodeled kitchens now serve as the main meeting space for our friends and families. You can even have wireless built into the kitchen cabinetry to power up all manner of gadgetry. It all goes to prove that kitchen cabinet design trends are moving in line with advances in technology, and why not – kitchens are the hearts of our homes. Their next trick is to associate quality cabinet type buzzwords like dovetail jointed drawers, European concealed cup hinges or other specialty hardware, special finishes or paints, and hardwood trim with faces as mentioned above. Fine cabinetry Austin, Texas consists of an entire 3/4" plywood carcass with a 1/4" plywood back. 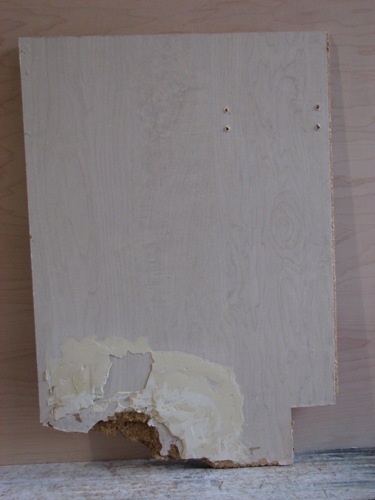 The plywood gives you some moisture protection against a leaking sink drain trap or faulty supply line or stop valve. European frameless cabinets can be painted on the interior using oil base enamels then covering all the visible exterior surfaces plus the doors and drawer fronts along with their edges with any choice of high pressure plastic laminate. 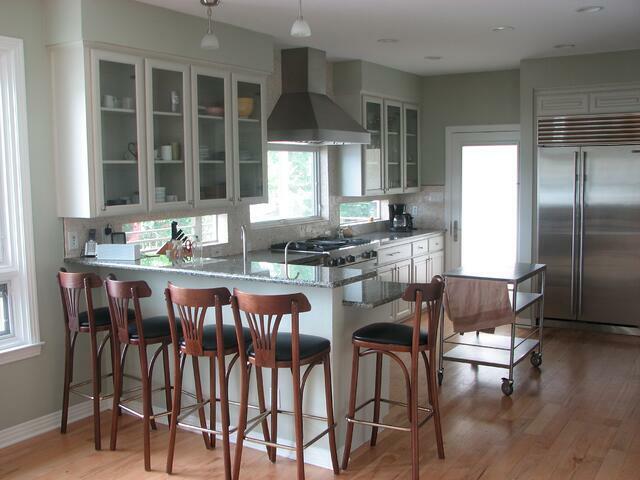 North American face frame cabinets can either be painted or stained and finished with polyurethane. The finish on the plywood makes even more less vulnerable to moisture problems. Don't get sucked into thinking that quality is behind the brightest glowing box on the sales floor and never forget that you get what you pay for in this life especially where cabinetry is concerned. Do your homework! I am a building professional who has been participating in Austin commercial office remodels and tenant finishes for over 30 years. I've watched beginning business owners sign a lease and blow through their seed money purchasing costly ammenities like window walls or commercial cabinetry that could have been staged later after their initial door opening and they've logged their first dollar. The beauty of metal stud walls below a grid ceiling is the ease of altering a given situation or floorplan. It is easier to add or remove these walls than it is the ones within your home. Electrical devices can be easily added or a lay in light fixture placed within the grid for additional lighting. 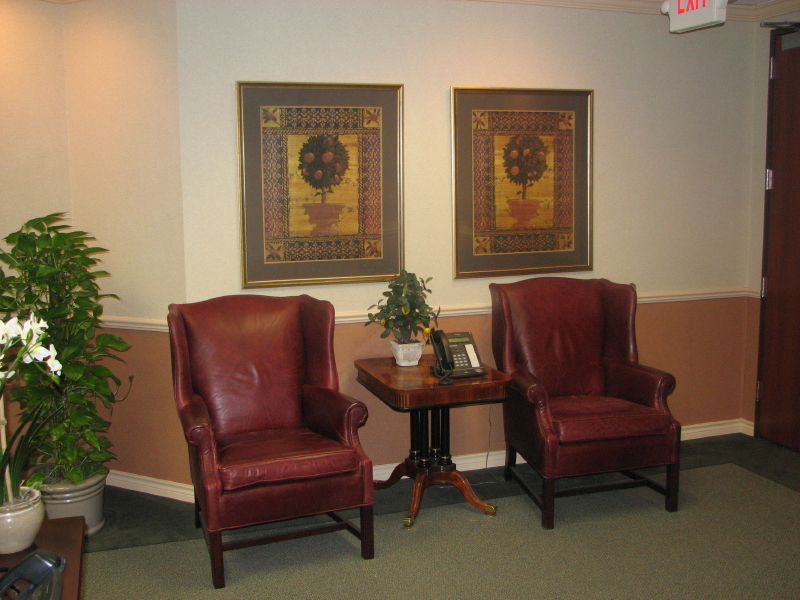 That is why the systems were created since not every office configuration will work for every tenant. Even the door and window systems clip together so that they can change locations without being destroyed. First find a trustworthy leasing agent with a good portfolio of available space for lease. If you're just starting your business find a property that you can live with for a while until your cash flow allows for office improvements. If you're established check and see if there is room for any needed expansion. Check out things like break rooms in nearby suites for future plumbing needs so that you can share a costly drain for sinks. Locate the electrical room because shorter wire runs for future circuits can save you money. Where is your space in proximity to the restrooms? Are the fire exits marked? Is the building ADA accessible? Next negotiate a multiyear deal so that your rent remains at a constant level. Once you move in it's time to plan for the immediate future. Remember that any improvements that you make that are attached to the building must remain in place when you vacate. Be smart and be sure any alterations you perform will enhance the way the space fits your needs. Think it through and who knows, you just might become a permanent tenant at your new address.